Posted March 4, 2016 by Emmanuel Sunday School. Our Sunday School class begins at 10 AM on Sunday morning. Class takes place in the Parish Hall during the Sunday Service. After the exchange of Peace, the children join their families in the church to participate in the remainder of the service. 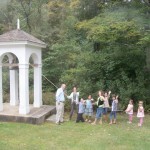 During the recessional, the children enjoy making their way outside to ring the bell to signal the end of the service.